So the wanderer returns. Having been in Spain on holiday and then in New York working for 3 weeks, my Weight Watchers diet has hugely suffered. Totally worth it though – not only have I had some brilliant food over the last month, I’ve actually lost weight! Ha! No idea how that happened, but I got my half-stone loss star today! Last week was all about getting back into the swing of things again, but not necessarily point counting. And as such I got to go through my foodie magazines with a completely open mind! And I decided to do something with duck, which I’m rapidly becoming good at cooking! So in August’s Delicious magazine I saw Pan-Seared Duck Breast with Braised Peas and it appealed, weirdly, due to the lack of carbs. I wasn’t fancying potatoes, pasta or rice but wanted something substantial. And this recipe was lovely. Really simple, easy to do and very tasty. Plus, I’m a sucker for peas and bacon – a perfect combination! KB rating 8.5/10. PR rating 7.5/10. Score the duck skin (do this with a sharp knife to allow the fat to render properly. Go through the skin and fat only – avoid cutting the meat itself). Season well. Heat a large ovenproof frying pan over a medium-high heat, then fry the duck, skin-side down, for about 8 minutes until the skin is crisp. Turn the duck over and cook for 2 minutes, then transfer to the oven and roast for 6-8 minutes. Set aside to rest. Melt the butter in a large pan and cook the onion and bacon over a low-medium heat until the onion is soft, then add the peas and cook for 2 minutes, seasoning with salt and pepper. Add the stock and simmer for 2 minutes until the peas are warmed through. Add the shredded lettuce and cook for 2 minutes, so they still have a slight crunch. Spoon into bowls and top with the sliced duck breasts. If required, serve with sauteed potatoes. 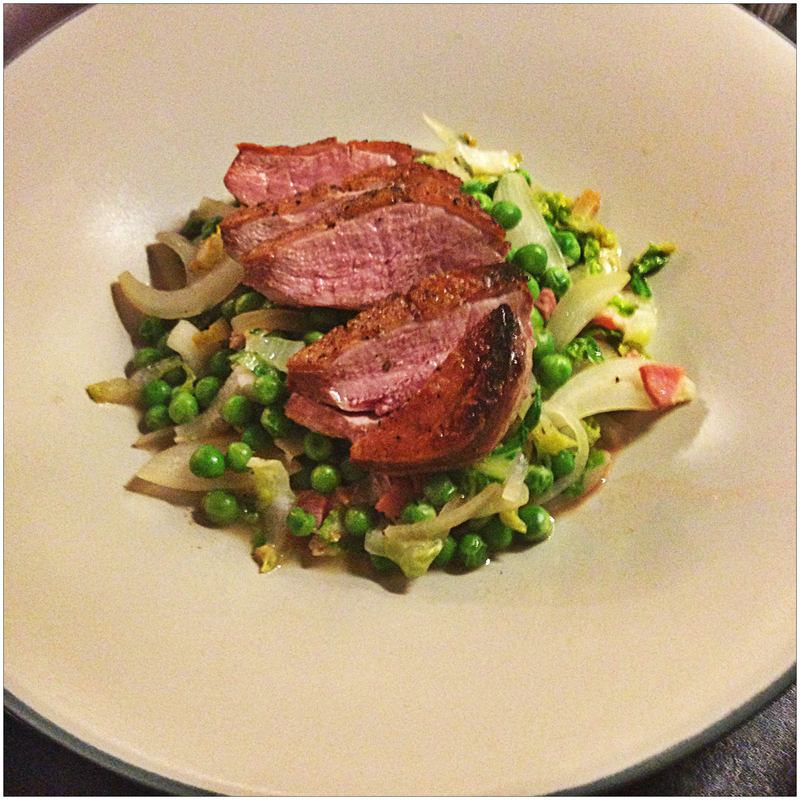 Categories: Duck, Reidbury Recipes | Tags: Delicious Magazine August 2013, Duck | Permalink. KB rating 8/10. PR rating 8.5/10. Place the duck legs skin side up in a small roasting tin, season with salt and pepper and roast in the oven for 1 hour, or until the skin is rich golden brown and the meat comes away from the bone easily. Meanwhile make the lentils. Place the lentils in a saucepan and add about twice the volume of cold water. Bring to the boil on a medium heat, then drain the lentils and set aside. Whilst the lentils are being pre-boiled, pour the olive oil in a large saucepan on a low-medium heat. Then add the carrot, onion, celery and garlic. Continue to cook for 10-15 minutes until very soft. Add the lentils and red wine, turn the heat up to medium and cook for 2-3 minutes or until the wine has evaporated. Pour in the stock, bring to the boil and then reduce the heat. Cover with a lid and simmer for 20-25 minutes or until the lentils are soft. Season to taste and serve straight away. Although you can reheat to serve if needed. Decorate with herbs if using. 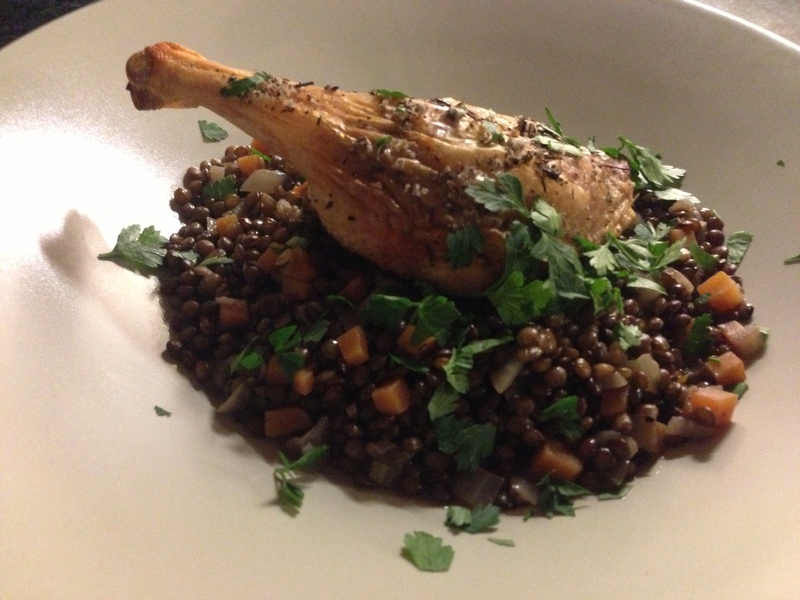 Categories: Duck, Reidbury Recipes | Tags: Duck, lentils, Rachel Allen | Permalink. With last night being Pancake Day, I wanted to cook something pretty light for dinner, so that Paul and I could also indulge in a pancake (or three) for dessert. I’ve not managed to cook much from either of my monthly food magazine subscriptions recently, so I flicked through the latest edition (March 2013) of Olive Magazine and came across something pretty light-sounding: Duck Breast with Ginger Sesame Greens. It’s not that often I’d be enthusiastic about serving something without carbs, but I’m so pleased I tried it. Really simple to do, not many ingredients, but packed full of flavour. And whilst I can sometimes find duck a little greasy, this was such a lovely way to cook it and it remained moist and just ever so slightly pink. I followed the recipe to the letter, and got great results. My only change in the future would be to add some fresh chilli to the greens (along with the ginger and garlic). But that’s a totally personal preference as there’s enough flavour from the sauce and the Chinese five spice on the duck. Rub the duck breasts all over on the skin side with the five spice. Put fat side down into a cold, non-stick frying pan. Heat the pan, then when it comes up to temperature cook for 10 minutes (keep an eye out, the skin should really crisp up but not burn!). The fat will gradually come out and the skin will go crisp and golden. Turn the breasts over and cook for another 5 minutes. Take out and rest under foil. Spoon out the excess fat from the pan. Tip in the soy, brown sugar, rice vinegar and a splash of water, simmer gently for 5 minutes. Add the duck back to the pan and glaze with the sauce. Stir fry the garlic and ginger in a pan or wok, then add the greens and cook for 2 minutes. Finish with a splash of sesame oil. To serve, put some greens into a bowl. Cut the duck in half on the diagonal and sit on the greens. Spoon over any sauce and sprinkle with sesame seeds. 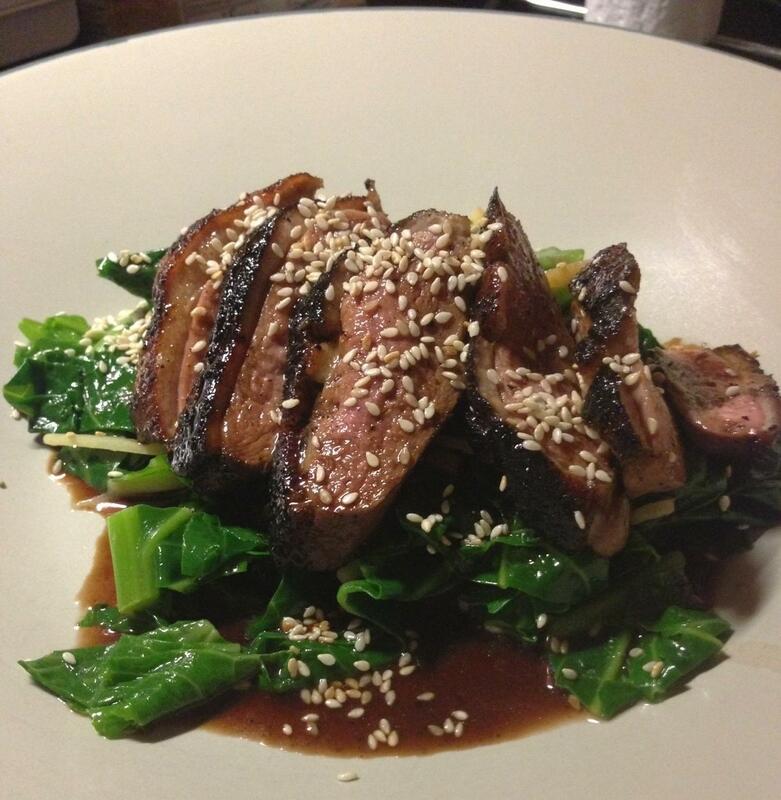 Categories: Duck, Reidbury Recipes | Tags: Duck, Olive March 2013 | Permalink.